Announcing the Paradiso Festival 2018 Full Lineup! A very limited number of GA Early Bird tickets will go on sale this Cyber Monday November 27th at 10am! As our ever expanding technological world evolves the way we interact and communicate with each other, the sense of intimate connections sometimes seems distant. For this reason it is paramount that we take time to live in moments of wanderlust and adventure. Each year we come together on a pilgrimage to find a balance between a modern digital world and the natural environment surrounding us. We welcome you to gather your family and journey back home on June 15th & 16th 2018 to the breathtaking Gorge Amphitheatre for the seventh year of Paradiso Festival! Be immersed in a land where modern technology and nature’s purity seamlessly blend together. 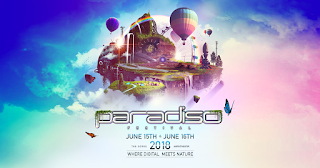 Experience three stages with world class visuals & audio production, thrilling rides & attractions, some of the biggest names in dance music, a stunning natural backdrop you have to see to believe, and the best part of all, the Paradiso family. Once again the time has come for the Pacific Northwest to shine at the center of the dance music world.